Our Costa Brava guide offers you a great opportunity to visit the main villages of the Costa Brava and their points of interest. The Costa Brava is a unique product resulting of the union of the Pyrenees and the Mediterranean Sea. It is a land of extraordinary beauty, where the landscapes of sea and mountains merge into one rugged coast. They often end up forming cliffs that finish in wild beaches or creeks of sand, where visitors can enjoy the sun that Costa Brava provides. The guide, village by village, provides of different landscapes, monuments, museums, viewpoints, etc. to visit. All are Costa Brava villages, and not all are coast villages, because Costa Brava is also the inside plain of the Ampurdán where its green and peaceful fields, easily remember those of Tuscany, in Italy. Therefore we invite you to explore the map, or locate the village in which you are interested in the sidebar list.You will obtain the description of her charms, photographs and the best places you can see there as well as other nearby villages that you can easily visit on your way. From Blanes, on the south, to Portbou, on north, the Girona coast has earned the reputation of being a prime spanish tourist destination for the quality of its beaches, summer weather and its great cultural and gastronomic treasures. Shortly after that new name many painters found inspiration in the Costa Brava: Picasso, Marc Chagall, René Magritte .. Salvador Dalí himself was born in Figueres and established his home in Cadaqués. He never was able to forget this landscape throughout his life, and set up his traveling painting studio on the coast itself as in Cap de Creus, in Palamós (Es Castell) Tossa de Mar..
What about today? How is the Costa Brava today? Well, despite the large number of visitors especially in high season that come the coast, attracted by its spectacular beauty, the landscape of the Costa Brava has maintained its identity far better than other areas of the Mediterranean. Each of the village of this region, known as the Empordà, retains its own character and culture, from its own Catalan language, through its gastronomy (strongly rooted and based largely on fish), to their regional dances such as the Sardana. Walking by these small and quiet villages of the Costa Brava one often has the feeling of being suspended in a medieval time. Many houses still retain the charm of that past. 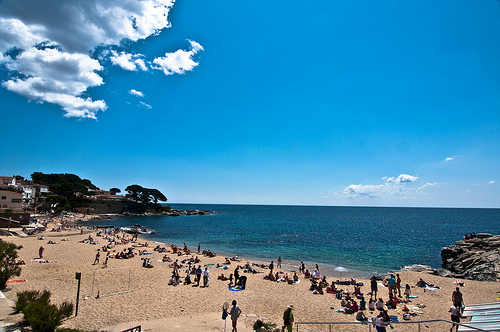 And just a few miles of the same villages you can find beaches of indescribable beauty, often very little frequented, or commercial cities Figueres, Girona Platja d'Aro. The Costa Brava offers therefore a wide variety of destinations to enjoy, from the Dalí triangle composed of the Dalí Theatre Museum, Púbol Castle or Home Museum of Cadaques, to the Natural Park of the marshes of Empordà, the rocky landscape of the Cap de Creus. But inhabited Empordà is even before medieval times. A good example of pre-historical evidence is found in the Iberian city of Ullastret, or in the Empúries archaeological museum and jaciments. The architectural heritage of the area is also outstanding. The Monastery of Sant Pere de Roda, in the Cap de Creus, is a great example of well-preserved medieval religious art. The richness of the coastline of the Costa Brava is always omnipresent but if you want to view it in its most expression you must visit the Medes Islands and the beautiful coast between Tossa de Mar and Sant Feliu de Guixols (which contains coves as pretty as Giverola, Canyells , Senyor Raimon, Vallpresona, etc.). 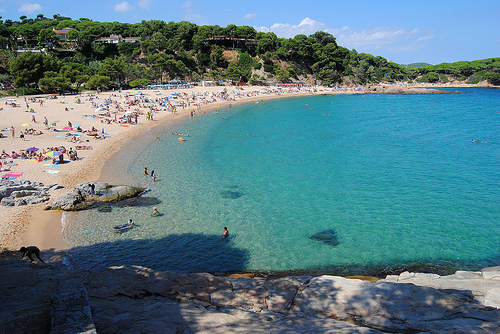 In turn, the Costa Brava offers extensive kilometers in some areas of fine golden sand like those found on the beaches of Pals or the area of Sant Pere Pescador. And all this at only 140 km from the capital of Catalonia, Barcelona, with which the Costa Brava remains excellent road links.